Worked on this smaller painting a bit today. Not finished yet. Thinking about subterfuge, release, transformation…. TRAP, acrylic, oil, and mixed media on panel, 14”x 18”. These are some paintings on paper that I’ve been working on recently, in addition to larger paintings on panel. It’s good for me to have multiple pieces to work on at a time because it gives the paintings time to dry and evolve, and also because I always have something to keep me busy! 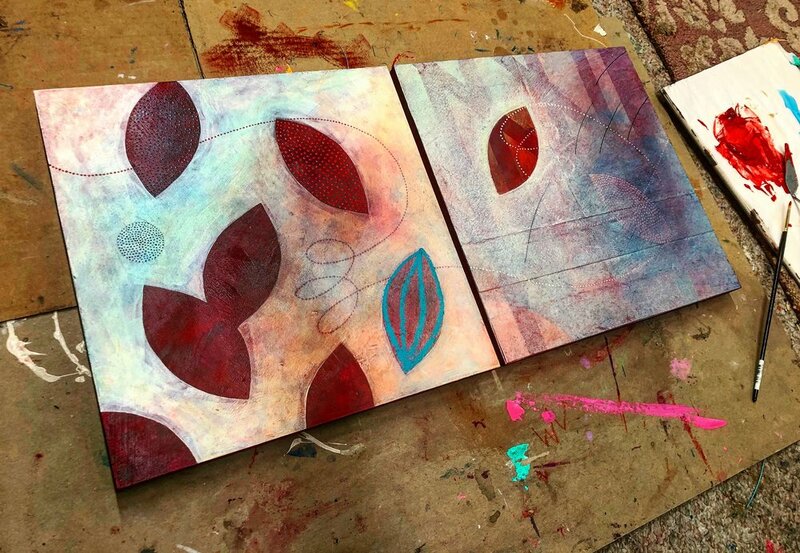 These two both involve mixed media; ink resist, acrylic and oil paint, micron pens, etc. 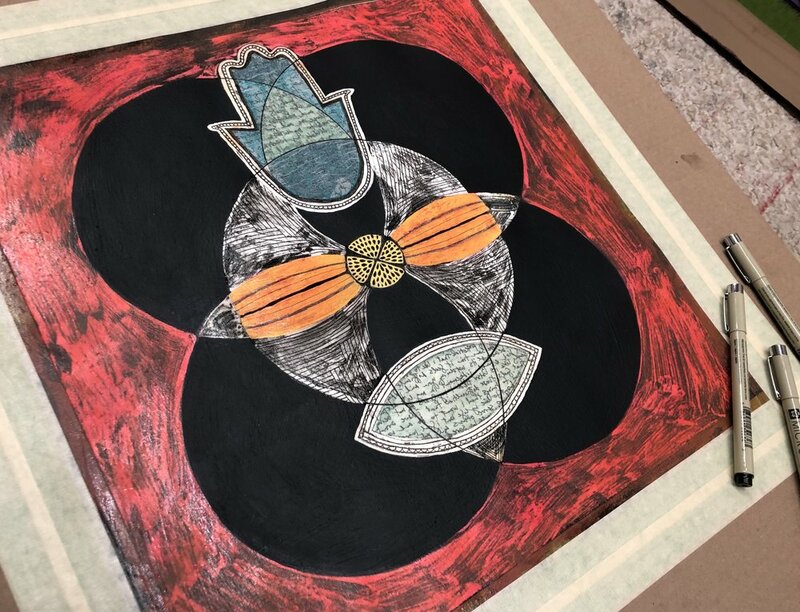 They’re about three quarters of the way done and the top image is titled, SHIELD, and the lower image is titled, THREEFOLD. I’ve only just started this, so it’ll change a lot....but this is where it’s at right now (shot at an angle because glare). So this one is close to done/or definitely done.....not sure. It’s meant to be minimal. Spare. 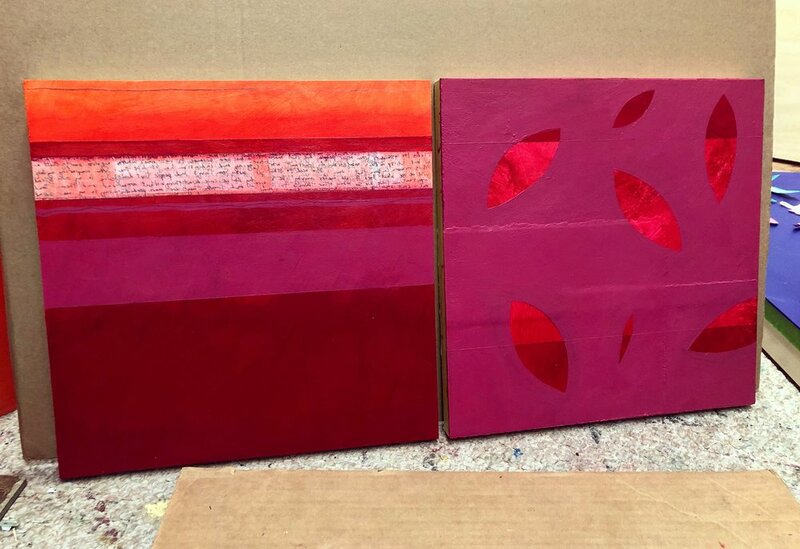 The two panels will be framed together as one piece. Trying to finish up all the loose ends/pieces in my studio. 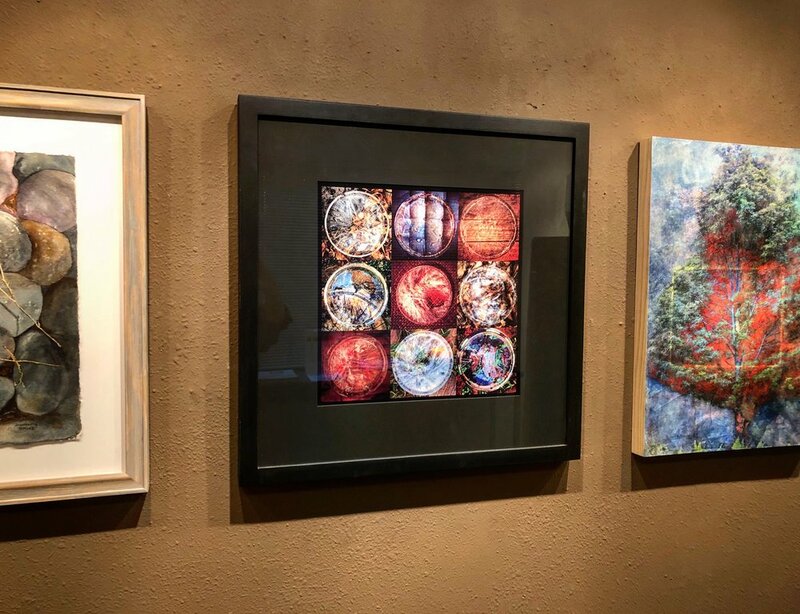 I have three of my photo grids from the ICE PROJECT in the BIOLOGIQUE show at the New Mexico Art League (one of them pictured here), which runs from Jan 15th - Feb 23rd, with a reception on Saturday, January 26th from 5-7pm. It started when Theo was brought to a high kill shelter in Aztec, NM, when he was two years old....and then saved from Aztec with a group of dogs and brought to Watermelon Mountain Ranch, a no kill shelter in Rio Rancho, NM. I adopted him from there and he had a host of problems.....Giardia, he wouldn’t go on a leash, I had to carry him in and outside because he had threshold anxiety, he was scared of everything and showed signs of having been abused, etc. He also wouldn’t eat if anyone was watching and so I always fed him outside. When it got cold in the mornings, I would notice that the ice in his bowl had frozen and I would take it out to refill the bowl and thought that it was really beautiful. I started photographing the ice (without manipulating it; in and around my home) as a project for myself and as a way to transform the mundane. I’ve been doing this for four winters now. Theo has come so far since I first adopted him. He still eats outside but he’s a really sweet dog (and a super protective guard dog!) and has overcome many of his anxieties. I'm really happy with the amount of work that I got done on this oil painting the other day. It's about halfway finished but I'm excited about the glazes and details that I'll be adding to it soon!